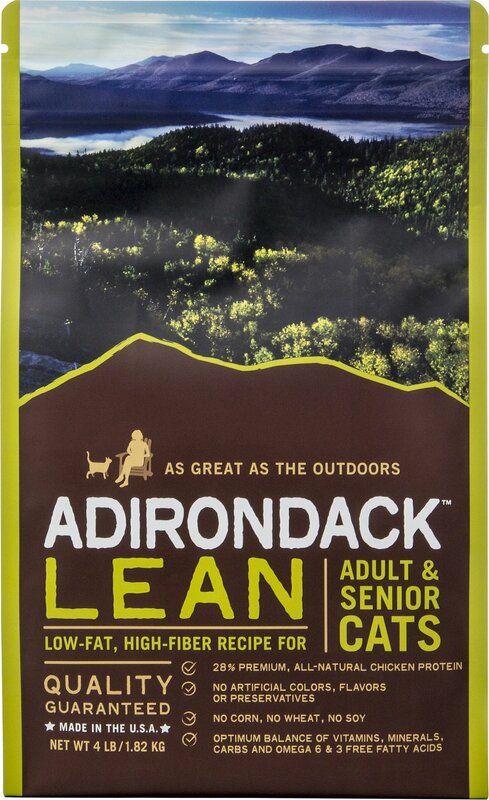 Feed your four-legged friend feline a food that’s as good as the great outdoors with Adirondack Lean Adult & Senior Recipe Dry Cat Food. 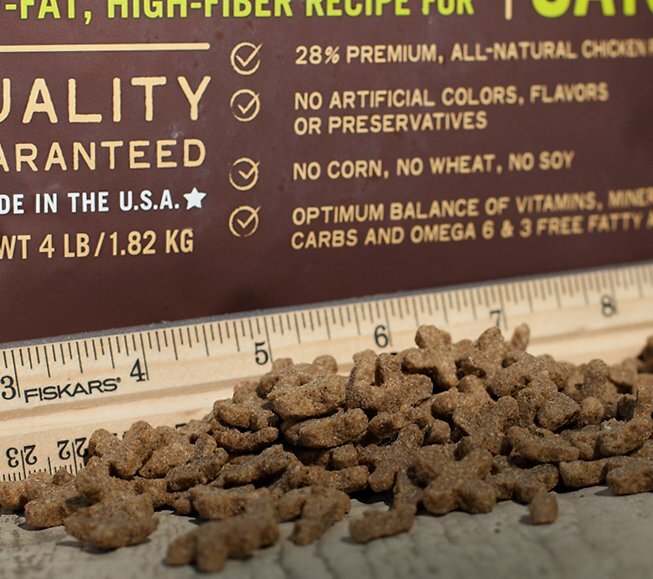 Formulated to maintain peak body condition for adult and aging cats, this premium-quality, all-natural food is enhanced with essential vitamins, minerals and nutrients to deliver complete and balanced nutrition with low fat and high fiber content. Added probiotics help support maximum nutrient absorption and overall digestive health, while omega-3 and 6 fatty acids help nourish his skin and coat. And because only the best will do for your favorite feline, it’s made in the USA without the use of corn, wheat, soy, artificial colors or artificial flavors. Premium-quality, all-natural food helps maintain peak body condition for adult and aging cats with 28% lean protein. Enhanced with essential vitamins, minerals and nutrients for complete and balanced nutrition with low fat and high fiber. Added probiotics help support maximum nutrient absorption and digestive health; taurine supports strong vision and healthy heart function. Made in the USA without the use of corn, wheat or soy, and no artificial colors, flavors or preservatives. 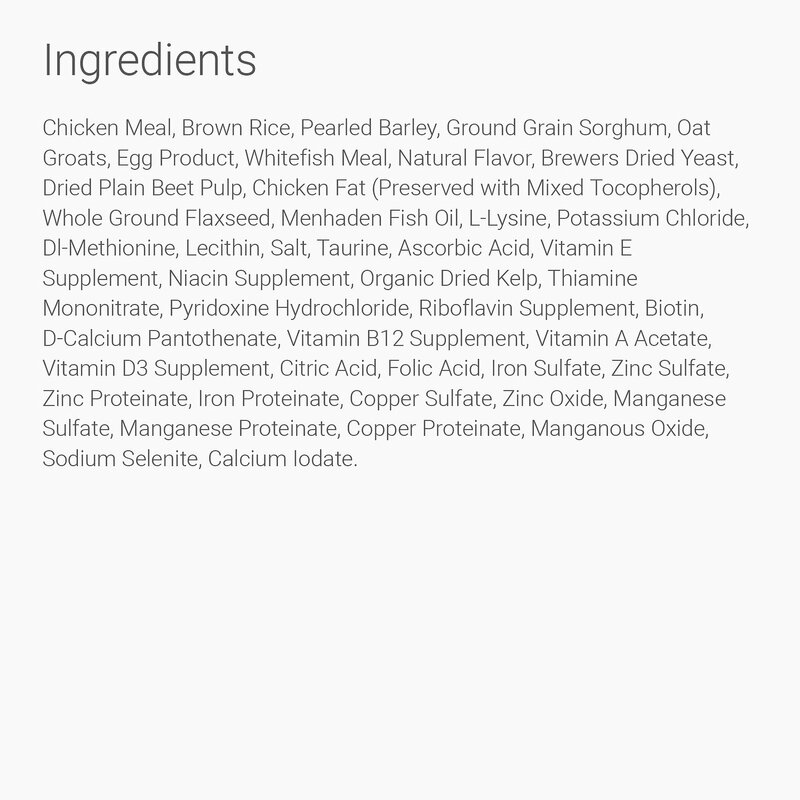 Chicken Meal, Brown Rice, Pearled Barley, Ground Grain Sorghum, Oat Groats, Egg Product, Whitefish Meal, Natural Flavor, Brewers Dried Yeast, Dried Plain Beet Pulp, Chicken Fat (Preserved with Mixed Tocopherols), Whole Ground Flaxseed, Menhaden Fish Oil, L-Lysine, Potassium Chloride, Dl-Methionine, Lecithin, Salt, Taurine, Ascorbic Acid, Vitamin E Supplement, Niacin Supplement, Organic Dried Kelp, Thiamine Mononitrate, Pyridoxine Hydrochloride, Riboflavin Supplement, Biotin, D-Calcium Pantothenate, Vitamin B12 Supplement, Vitamin A Acetate, Vitamin D3 Supplement, Citric Acid, Folic Acid, Iron Sulfate, Zinc Sulfate, Zinc Proteinate, Iron Proteinate, Copper Sulfate, Zinc Oxide, Manganese Sulfate, Manganese Proteinate, Copper Proteinate, Manganous Oxide, Sodium Selenite, Calcium Iodate. Fresh, clean eater should be kept available to the cat at all times. Not for human consumption. we have 7 cats in two households. none of them cared for the taste of this cat food. It does genuinely have low calories which is what i was looking for. I transitioned to this food as a cheaper alternative than what I was feeding. Calorie content is almost the same and both my cats like it. 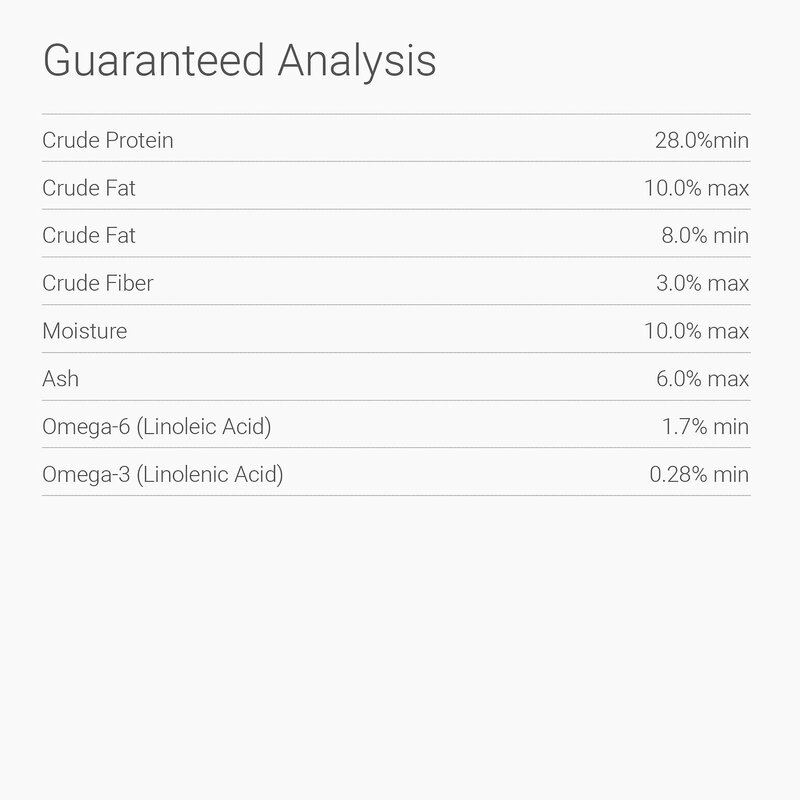 I have both a lean cat and heavier cat and this food works well for both. The only thing I would disagree with is the feeding recommendations on the bag. The amounts are significantly higher than what I feed or would recommend feeding. "Nope, no way, not going to do it"
Cats are picky, so maybe other cats will like this food, but my 6 cats don't care for it at all. 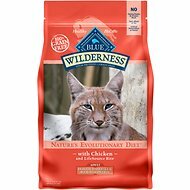 I ordered this by mistake, meant to re-order the regular "lean cat food" (blue bag), which the cats really like. This product will not be ordered again. My cats could give or take this really. I gradually mixed in with their previous dry kibble and they tended to leave this new food behind. I bought this food to transition my older cat to a senior cat food. He loved it immediately, choosing it over his former favorite. The pieces are easier for him to chew as well. My cat will eat anything but this. She ate a little of this and walked away. She would pick out her old food and not eat this. I won’t buy it again. They much prefer Purina for cats 11+. Won’t touch this. I was really hoping that my senior cat and 2yo cat would love this new food. Unfortunately, they hated it. My senior cat is a glutton so he chowed down then proceeded to vomit all over my house :( Then he wouldn't touch the food for days. Needless to say, I ended up back at the pet store trying for another brand.